For centuries, heavenly angels have been depicted as ethereal, divine, beautiful beings who interact with humankind. They are believed to be celestial messengers and guardian spirits. 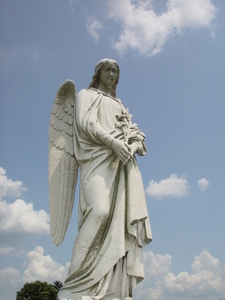 It is important to mention that angels are not exclusive to the Christian tradition, even though the Christian concept of angels has had a strong impact on our idea of heavenly angels. In fact, other cultures and religions - both past and present - share the concept of divine messengers and guardians. You will find angels in Jewish and Islamic traditions, for example. You will also find guardian angels (called Favashi) in Zoroastrian lore. The presence of angels among us is not a thing of the past. The fascination with these mystical beings continues. They appear in books, movies, TV shows, art, and a wide variety of merchandise. Maybe we are so fascinated with heavenly angels because they walk between two worlds: the celestial realms and the mortal plane. Angels are also in constant contact with humankind. They guide us, they protect us, they inspire us. They have, in other words, a positive impact on our lives. They help with mundane problems and with big undertakings. Indeed, the apocryphal Book of Enoch says that it was the angels (known as the Watchers) who taught agriculture to human beings. They also help us with day to day problems, such as helping us find our car keys. Interestingly, the image we have of angels is relatively recent. In the Bible, angels are usually described as regular men. A passage of the Bible reminds us: "Do not forget to entertain strangers, for by so doing some people have entertained angels without knowing it." (Hebrews, 13:2, The New International Version). 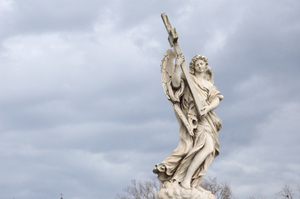 It was the European artists who popularized the wings and halos we now associate with angels. The first paintings depicting angels with wings appeared in the 4th century AD. Several centuries later (during the 12th and 13th centuries to be exact), angels had become extremely popular among Christians. Why did angels become so popular? Some say that the accounts of medieval saints about their angelic encounters may have been a factor. Saint Francis of Assisi was one of those saints. How did angels get their wings? Some experts believe that Christian artists were influenced by the winged, angel-like beings venerated in many ancient cultures. For instance, Ancient Greece’s Nike of Samothrace (also known as the Winged Victory) looks very similar to our modern idea of angels. And Nike was only one of the many winged deities and mythical beings of Ancient history. Click here to learn more about other winged creatures. Regardless of how angels got their current appearance, they have become an essential part of the daily lives of many. Angels in the Bible – Bible passages and quotes about angels. Angels of the Bible – More quotes about angels, taken from the Holy Scriptures. Bible Angels – Biblical stories about divine beings. Angel Bible Verses – More mystical stories about angels to inspire. Angels in Heaven – More information about heavens angels. Heavens Angels – Pictures, quotes and thoughts about angels. Heaven Quotes - Quotations about the heavenly realms. Heavenly Quotes - More celestial quotes to inspire you. Miracle Quotes - A small collection of inspiring thoughts, sayings and insights. who though invisible are always with you. . . .
in all your temporal and spiritual affairs.